We did not get a lot of sleep with all of the noise all night from the celebration of the soccer tournament – horns, fireworks, police sirens. Someone said that it was near riots. Police had to use tear gas to run off the people. Our bus left at 8:15 instead of the usual 8:00. We were on the road for a couple of hours before our first rest stop. 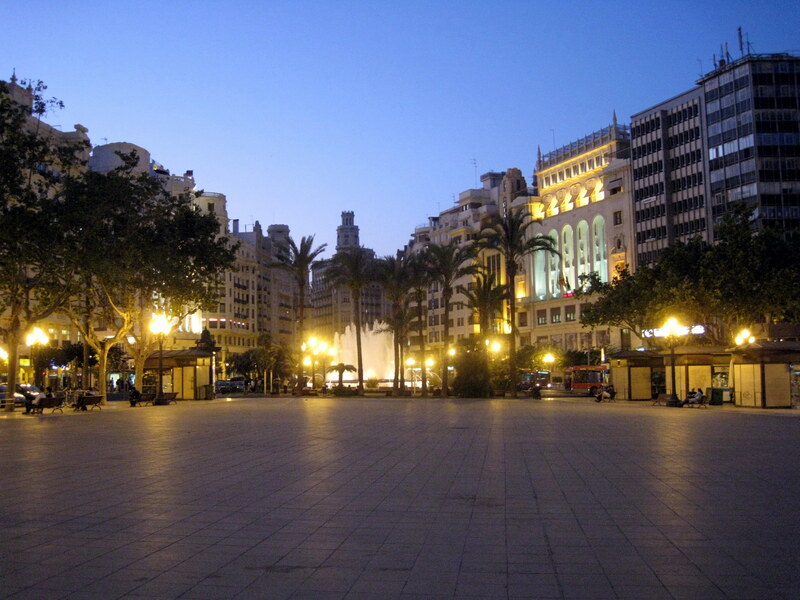 Our arrival in Valencia was after 1:00 pm. 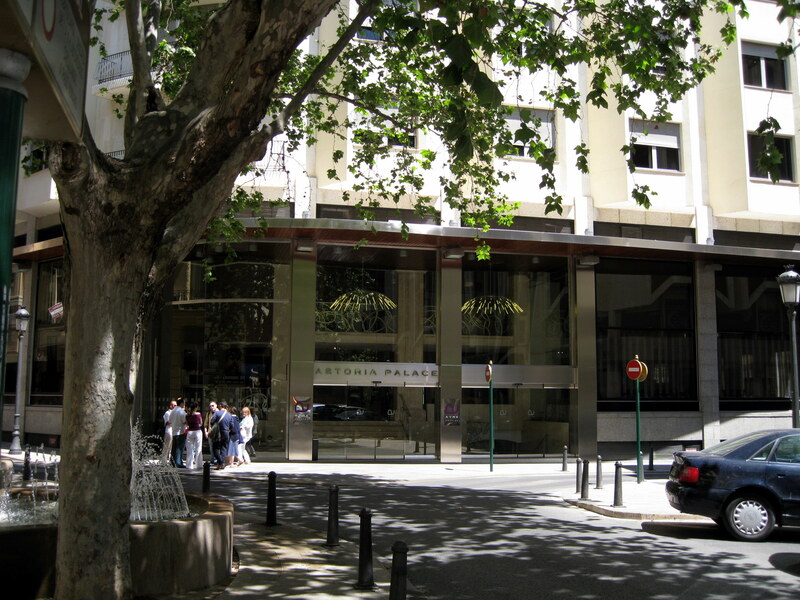 Our hotel, The Astoria Palace, was located about a block and a half from the center of town. It was rather modern, with a lot of glass on the first floor lobby area. It was facing a small treed courtyard. After we checked in, we were on our own for lunch. We found a nice restaurant where my wife indulged in a paella, and I had a hamburger. 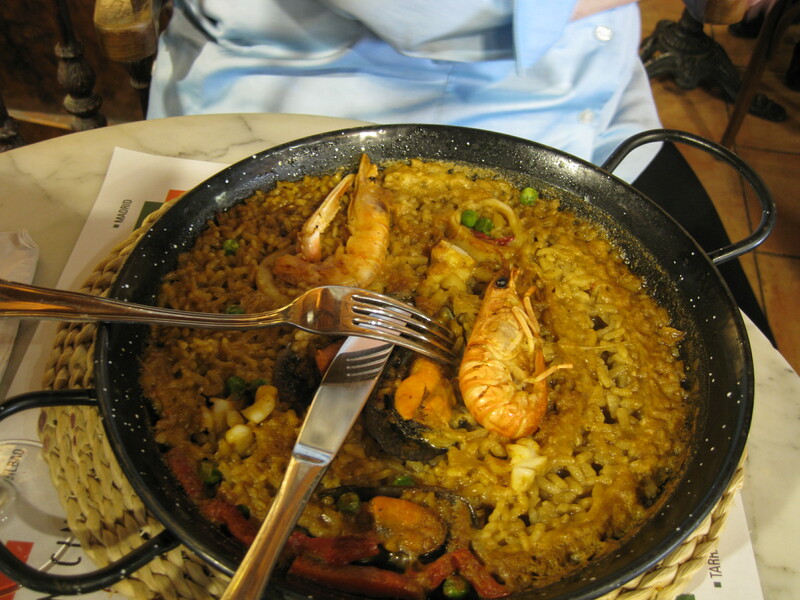 We could have done with just the paella as it was much larger than the waitress had indicated. The hamburger was a double decker with cheese and onion in the middle and a piece of bacon (ham) on the top layer. It was hard to eat and not very good. A McDonald’s would have been better. After lunch we walked around a little and went back to the hotel and my wife took a little nap. At 4:00 we got back on the bus for a tour of the city with a city guide. Our first stop was the City of Arts and Science. This is an amazing place with what looked like space age architecture. 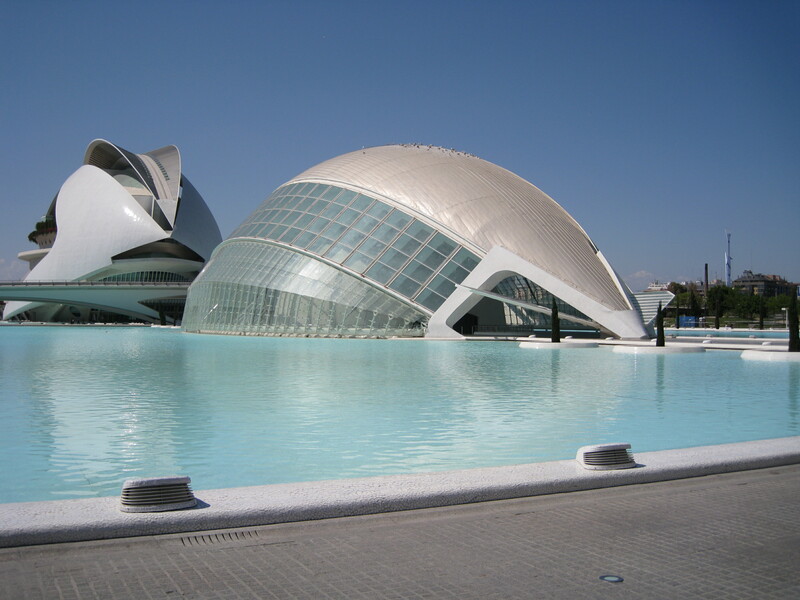 In a bid to rival Seville's Expo and Barcelona's redeveloped port, Valencia competes with what has been called "the largest urban complex in Europe for cultural, educational, and leisure expansion." It's in the southern part of the city, on a 90-acre site in a carefully landscaped park. The goal of the complex is to make learning fun. 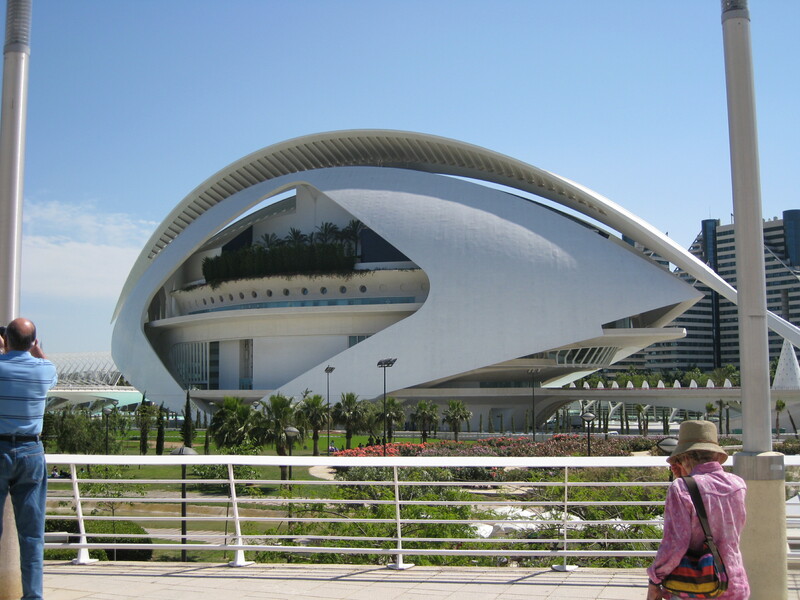 The state-of-the-art educational center consists of four main buildings: L'Hemisferic: Designed by world famous architect Santiago Calatrava. This building offers documentaries and an exploration of the universe. A laser show runs on 900-sq.-ft. concave IMAX screen, with the soundtrack in four languages, and six-channel stereo.Museo de las Ciencias Príncipe Felipe: Devoted to science and discovery, the building takes the form of a vast roof supported by a transparent glazed north facade and an opaque south facade. At the center, the visitor can not only look at, but also touch and feel in this "museum of sensations." The museum is filled with special exhibitions demonstrating the high technology of companies in the 21st century.L'Oceanografic: 20 acres of the complex are devoted to lagoons and leisure pavilions arranged into an underwater city that re-creates marine habitats from every ocean. There's also a dolphinarium for aquatic shows and a miniport for playing with remote-controlled boats. Submarine glass walkways connect the areas. An underwater restaurant is on-site. Palacio de las Artes: A 150-ft. glass and metal construction contains one outdoor and two indoor auditoriums. All three have the latest technology for the performance of plays, opera, and music. All four of the buildings were rather amazing and hard to describe. Even though we had time to walk around the outside, time did not permit us to go into any of the buildings. 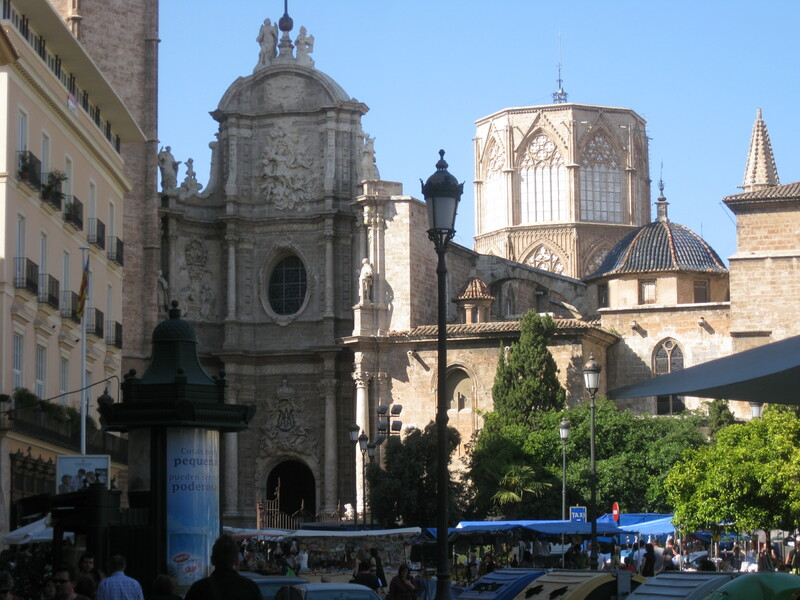 After driving through various areas of Valencia, we were dropped by the basilica and cathedral for a walking tour. The basilica and the cathedral were two separate buildings. 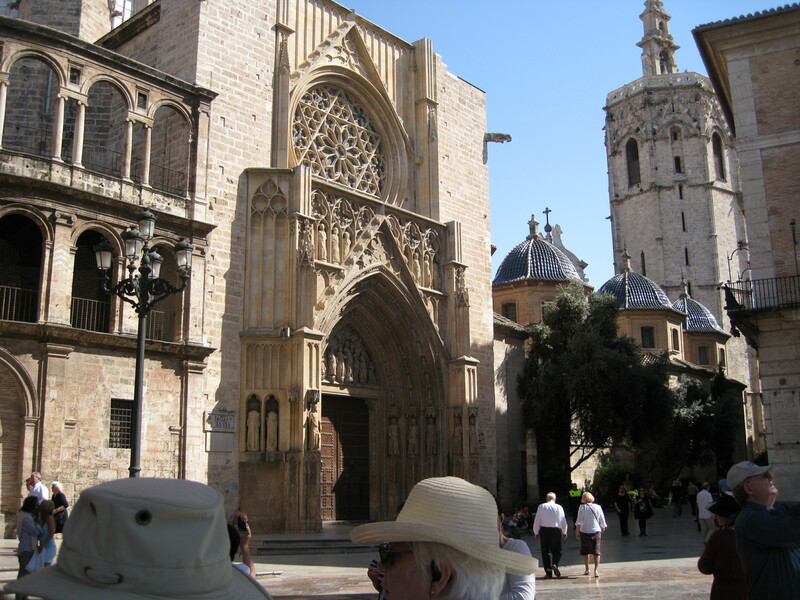 We stopped outside of the basilica which is attached to the cathedral by a renaissance archway. 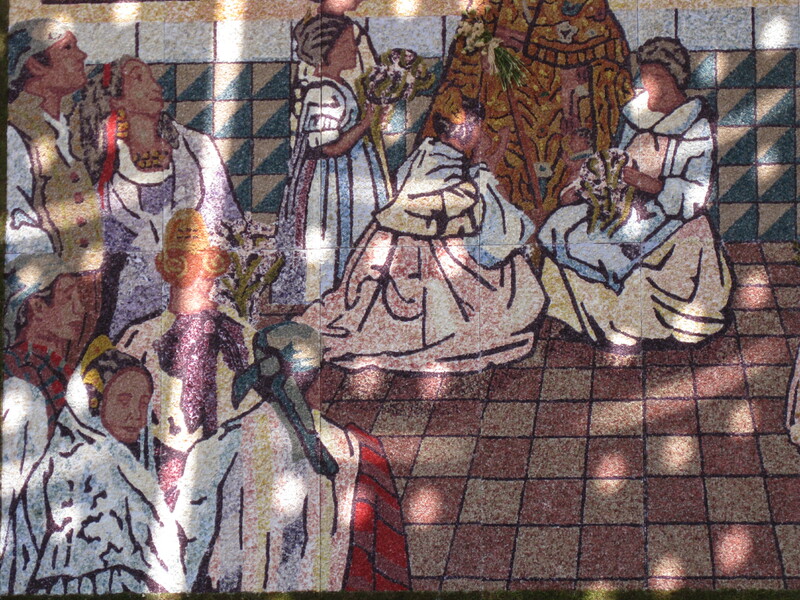 On the outside wall of the basilica was a huge tapestry made entirely of flowers. 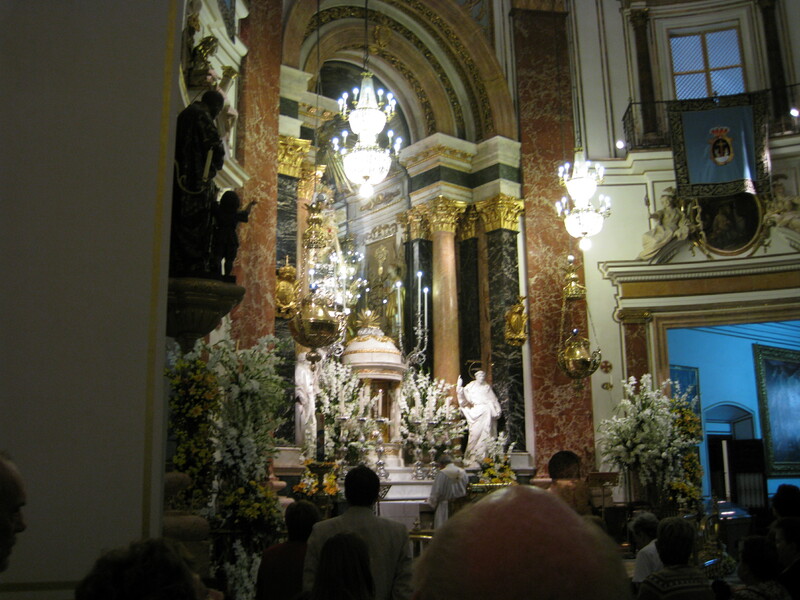 We went inside where a service was taking place in a chapel that had a beautiful baroque dome and the altar was surrounded by real flowers. The basilica of the Virgen de los Desamparados is the site of the statue of the namesake virgin of the basilica. The basilica is the sanctuary of the Geperudeta (the Little Hunchback), the virgin who is known for her efforts to protect the less fortunate. The statue itself is gothic, with a Byzantine face, a long head of hair and is adorned by numerous jewels donated by the faithful. 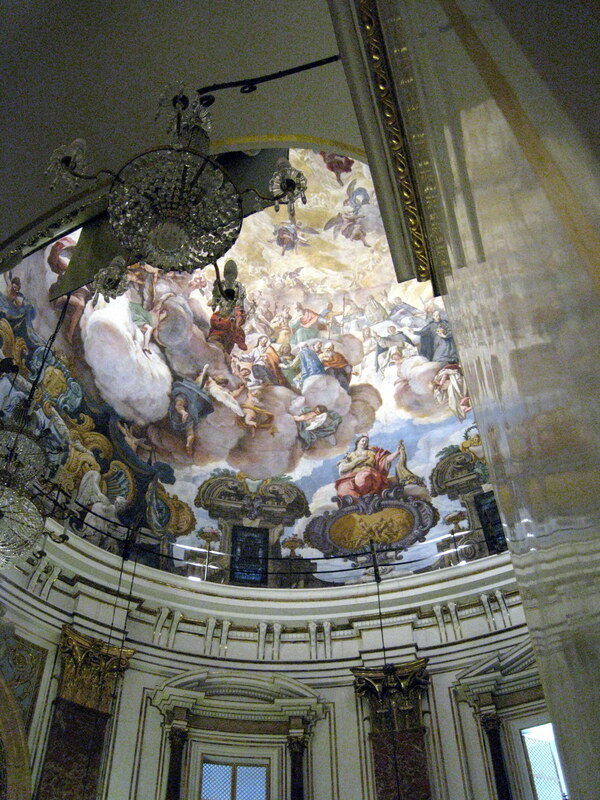 The basilica was constructed between 1652 and 1667. Because of the service we did not see the statue. The guide walked us around the back side of the basilica/cathedral but did not take us in. We entered the cathedral on our own. Near the front door we enjoyed seeing a large family with babies and children all dressed up for a baptism that had just happened. 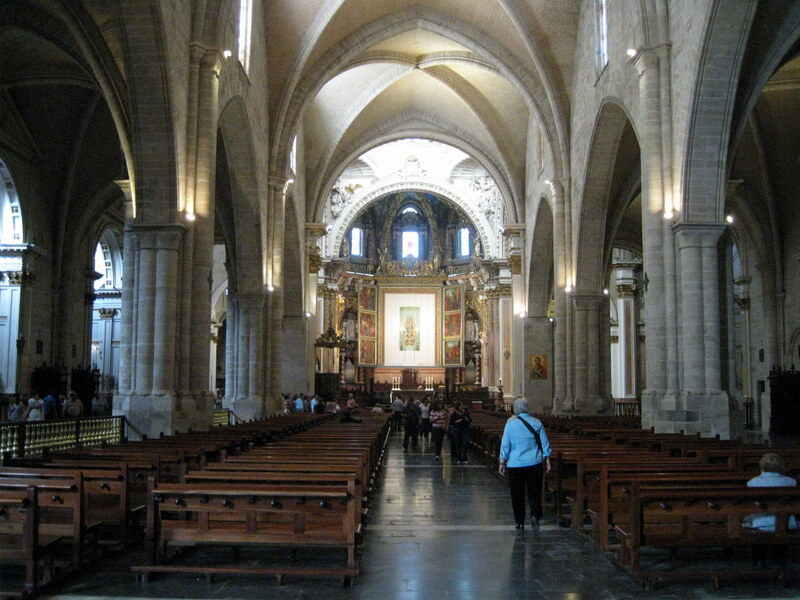 Valencia Cathedral was built between 1252 and 1482 on the site of an earlier mosque and perhaps a Roman temple of Diana. It was originally dedicated to the Holy Saviour. 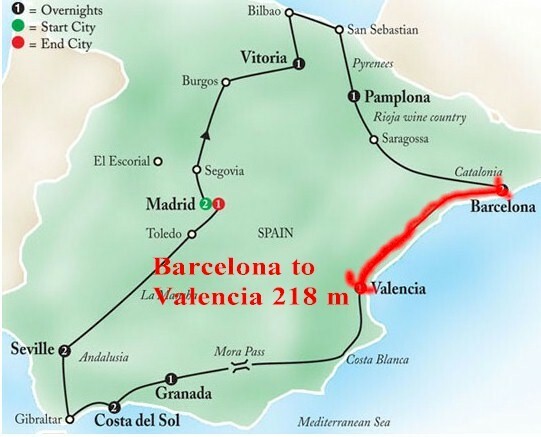 El Cid dedicated it to the Blessed Virgin; and King Jaime the Conqueror did likewise. King Jaime left in the main chapel the image of the Blessed Virgin which he had carried with him (now preserved in the sacristy). One of the chapels is said to have the Holy Grail, the chalice Jesus used at the Last Supper; it's on display in a side chapel. We did not see it. Also in the 15th century the dome was added and the naves extended back of the choir, uniting the building to the tower and forming a main entrance. At the beginning of the 18th century, the German Conrad Rudolphus built the Baroque façade of the cathedral’s main entrance. A restoration in the same century rounded the pointed arches, covered the Gothic columns with Corinthian pillars, and redecorated the walls. In the war of 1808, a magnificent silver reredos was carried away and melted into coins to meet the expenses of the campaign. We walked back down past the cathedral and found an outside café where we sat in the sun. Then we walked back to our hotel. We had a good dinner in the hotel. It consisted of veal and paella and a fancy dessert. After dinner we walked around the part of the city near our hotel. 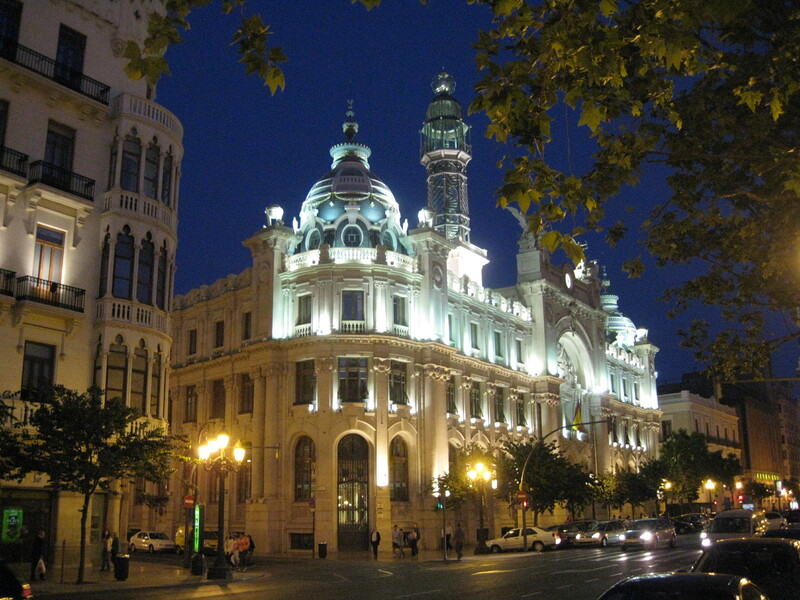 The beautiful official buildings were well illuminated. In the center was a large foundation with changing colored lights. When we went back towards the hotel, there was a musician in the small courtyard in front of the hotel. Across from the hotel was a bank call the Holy Ghost Bank. We used the cash machine so we could see our bank statement.